The Curly Wirly Twirly Girlies: Let it snow ! Serendipity indeed. That foil action that atomic cupcake has just released, it is the answer to my prayers for that snow layout. Thank you so much everyone who left me or emailed me their ideas. I knew I wanted some colour near the photo of my son on the left, but a boy, wrap or flower wasn’t right. I have to be honest, I am not a glitter girl – I know I can hear the sharp intake of breath – everyone else loves it, but it just isn’t my thing. I’m not saying I won’t ever use it, I am just not drawn to it. Must be all those years in uniform LOL, it squished my inner girliness – don’t worry my daughter has it in spades and makes up for both of us. So anyway, as soon as I saw Atomic Cupcake’s new actions I just knew – foil snowflakes – they sparkle, they add colour, they did the trick (plus a few ideas from the lovely people that visit this blog and care enough to read my ramblings). 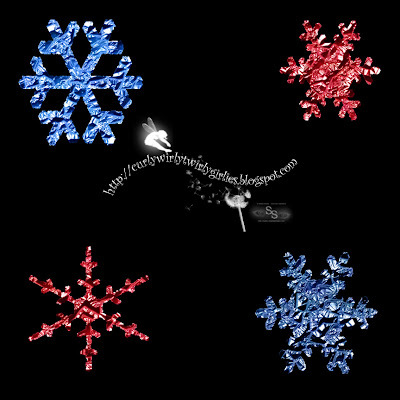 So here are the snowflakes I made, still in Pam’s Jump Red and Blues. By the way check out Jeannie’s tag response – Jeannie has been added to my I want them at my next party list. This lady has really lived life – and you have to see that mad 80’s big hair. Does that bring back memories , the teen mags with pictures of Jon Bon Jovi and all the rock “hair” bands, or all the “new romantics” like Duran Duran, Spandau Ballet, and the like with the big fringes - or my dreadful poodle perm, cockatoo fringe, or mod (think The Cure) phase LOL. Erika - I am totally loving the foil action too - check out the hazy summer alpha later! It's funny, but I always hear strange noises when Rob is gardening! I think men just like to use tools! Good for you re the generic stuff using actions - I agree with you - well said! i love these snow flakes! they are just the right touch for a boy page. do we get to see the page with the new addition?